Langley City Hall sports peas, beans and tomatoes growing in feed troughs and along the walkway to the front door. 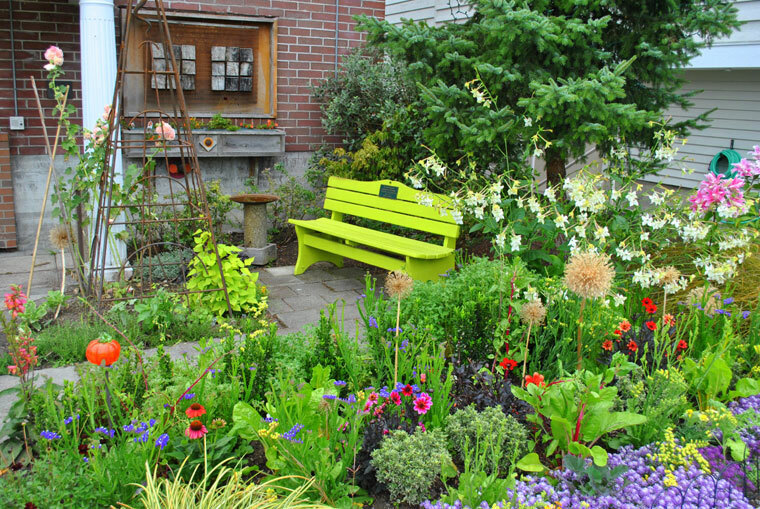 But that’s not all, The edible garden design included whimsical sculpture, an inviting, bright bench, along with raised beds and planted plants that provide year-round interest. It is all part of the garden initiative effort to design a citywide landscape that began in 2013, inviting tourists and locals alike to take a bite out of the landscape, quite literally. Under the guidance of the Langley Main Street Association program, with support from the Whidbey Island Garden Tour, South Whidbey Garden Club, Log House Plants, and Renee’s Garden Seeds, as well as the weeding talents of the Main Street interns and the hard work of volunteers, a delightful edible garden at Langley City Hall was created in 2013. 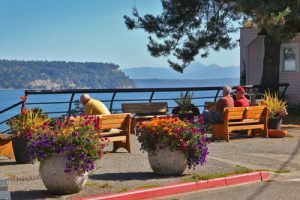 The project was funded by a grant by the Whidbey Island Garden Tour and the South Whidbey Garden Club, funds from the Langley Main Street Association, and private donations.